Comment: Dark red Rhodolite in mammoth size. Precision cut in the USA. Full AGL prestige report. 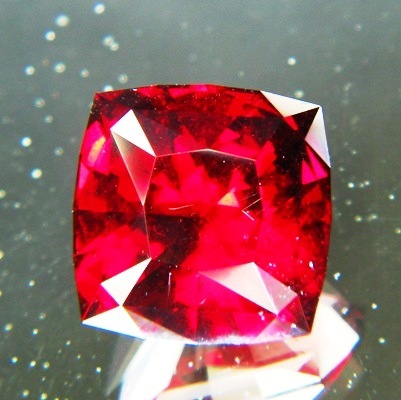 Not a merry glitter-lustre gem, but a planet of deep glowing red-red in fine cut and daring size. Dark but never black, the handshot shows this best, while the main image caught the purity of the hue. No inclusions that are visible to the eye. Comes with an extra big piece of jungle protection. Collector item or giant OMG!-pendant for the special event. At $360 per carat offered without premium for its rare size. 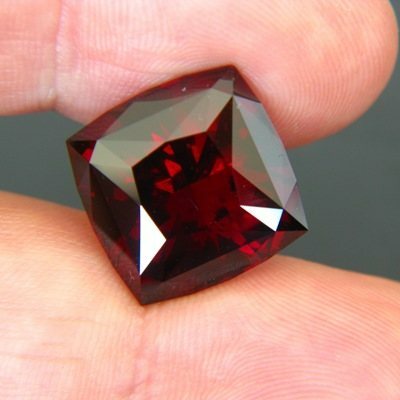 Perhaps the biggest precision-cut Rhodolite available in the market.